Do you need to open a folder? 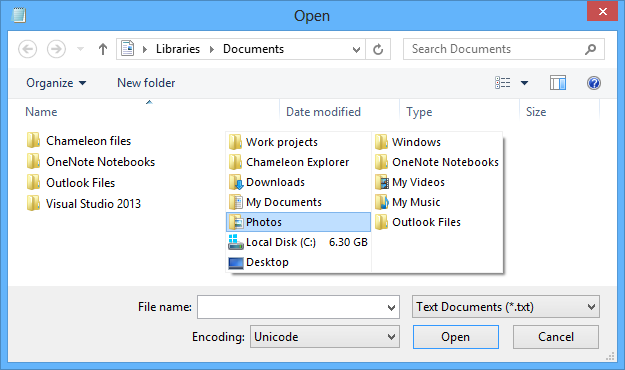 You can open folders everywhere from a menu of your favorite folders, including dialog boxes for opening and saving all programs. Are you working with several folders at the same time? Divide your window into two, three, or four constantly-visible panels containing these folders. Do you frequently work with the same set of folders? Save the set and open it whenever you need to with a single click. Are you done working with one set of folders? Just close it and create any number of sets. Are service files or folders getting in your way? Use filters to see only what you need. 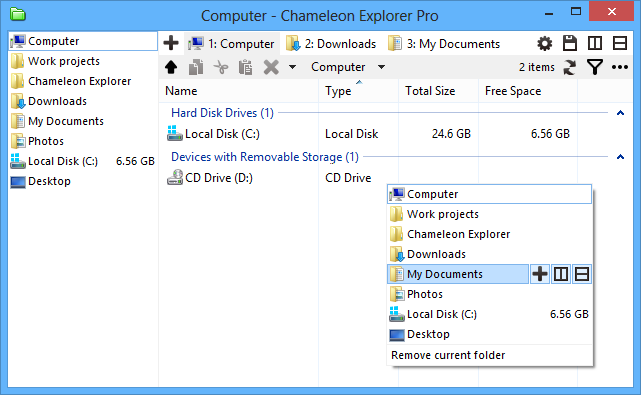 Chameleon Explorer completely replaces Windows Explorer and is also compatible with its extensions. Set up menu of your favorite folders once, then open these folders anywhere — in Chameleon Explorer, in dialog boxes for opening and saving all programs, on the desktop, in the taskbar, or even in Windows Explorer. Any files or programs can be added to the menu. Do you want to open an additional folder? Are you working with several folders at the same time? The window is automatically resized to fit the current number of panels. Are you working on various tasks with different folders at the same time? Do you frequently work with the same set of folders? Do you want to see only the files and sub-folders you need? Do you prefer to work with the keyboard? Standard hotkeys are available for basic functions. To search in the current folder, just start typing. To change your path, press the spacebar. If you need to execute a command, just type the command and press Enter. (Under development) A Command Palette with fuzzy search is available for less common commands. Just press Alt and enter the command. You can paste text or pictures from the clipboard right into folders, thereby creating new files. 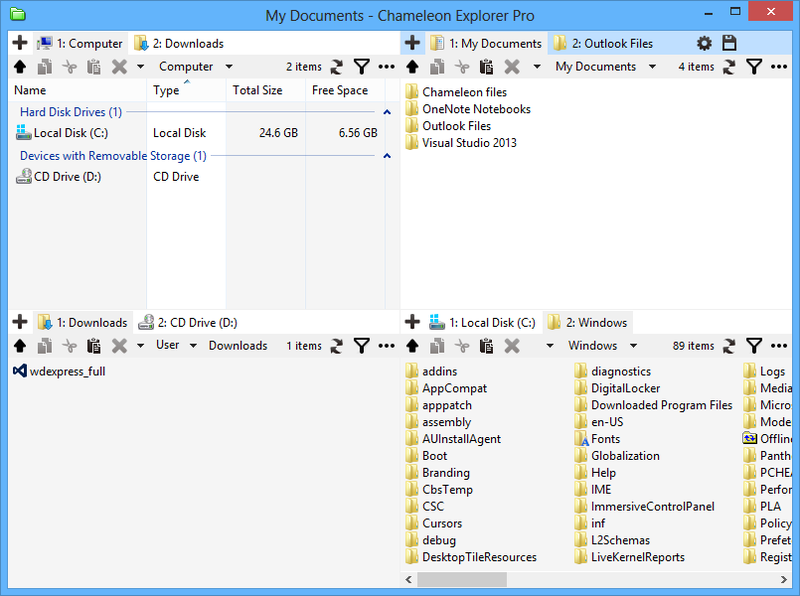 Chameleon Explorer is compatible with third-party extensions for Windows Explorer, the most interesting of which can be found here.